During the holidays, it’s all about easy dinner recipes. Recipes that are prefect for busy holiday schedules. This recipe is made with convenient ingredients, making it easy to prepare. It bakes in the oven in under an hour. 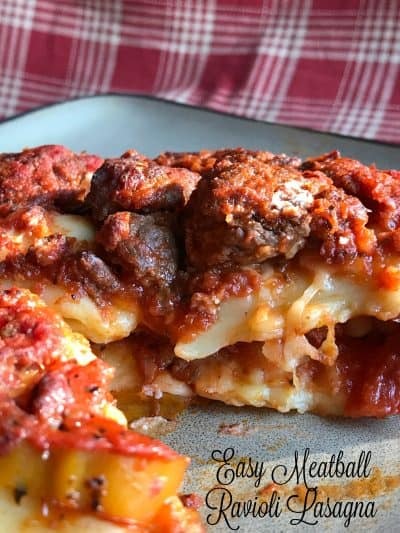 Easy Meatball Ravioli Lasagna can be reheated in the microwave. Perfect for the family members who didn’t make it home in time for dinner but walk in the door starving! Holidays are super busy and most people don’t have any extra time to whip up a pan of lasagna. With it’s slow simmering sauce, hand shredded cheese and homemade lasagna noodles, leave that recipe for another day. A day when you’re not rushing out the door to your daughters Holiday Choir performance or off to church for the 75th annual production of ‘Oh Little Town of Bethlehem’ to watch your son play a Wise Man. Now that my kids are grown up with families of their own, my holidays aren’t busy anymore. With the convenience of online shopping and gift cards, I’m done shopping, without even leaving my house! I still put up a tree, once ‘real’ but now it’s silver. Still decorate my house, but I only put up a few ceramic houses instead of a village. I still make cookies and candy, that I usually bring to the kids house. In-between the shopping, wrapping, baking, tree decorating, and working, remember to relax and enjoy the holidays. 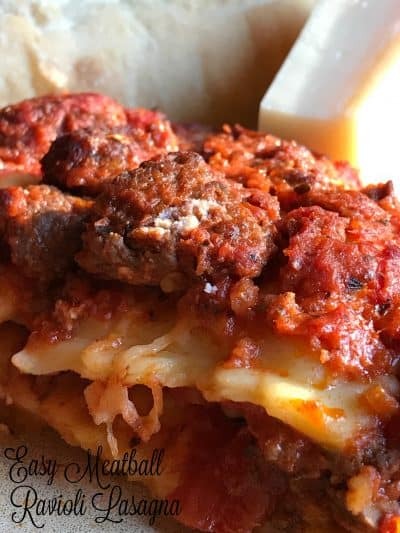 Take a deep breath, kick your shoes off, pour yourself a glass of Chianti and reach for this fantastic recipe and make Easy Meatball Ravioli Lasagna. I enjoy an easy yet delicious recipe during the holidays and this recipe fits the bill. Psst…this recipe is super anytime of the year! Preheat oven to 375 degrees. Lightly spray a 3 quart baking dish with non-stick cooking spray. In a large bowl combine spaghetti sauce, garlic powder, onion powder, Italian seasoning, salt and pepper to taste. Spoon 1 cup spaghetti sauce into bottom of prepared baking dish. Layer with half of the cooked ravioli, half of the cooked meatballs. Carefully spread half of the ricotta cheese over meatballs. Spoon on half of the spaghetti sauce, sprinkle on half of the shredded mozzarella cheese and grated Parmesan cheese. 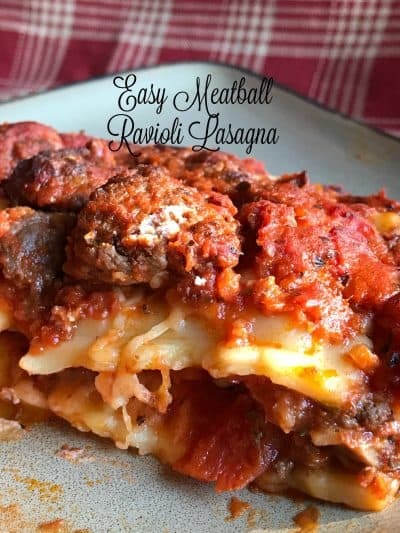 Repeat layers; layer with remaining cooked ravioli, remaining cooked meatballs, ricotta cheese, remaining sauce, mozzarella cheese and ending with remaining Parmesan cheese. Cover and bake for 45 minutes. Uncover; bake an additional 10-15 minutes longer or until bubbly and top is golden brown. Sprinkle top with fresh minced parsley. Serve.